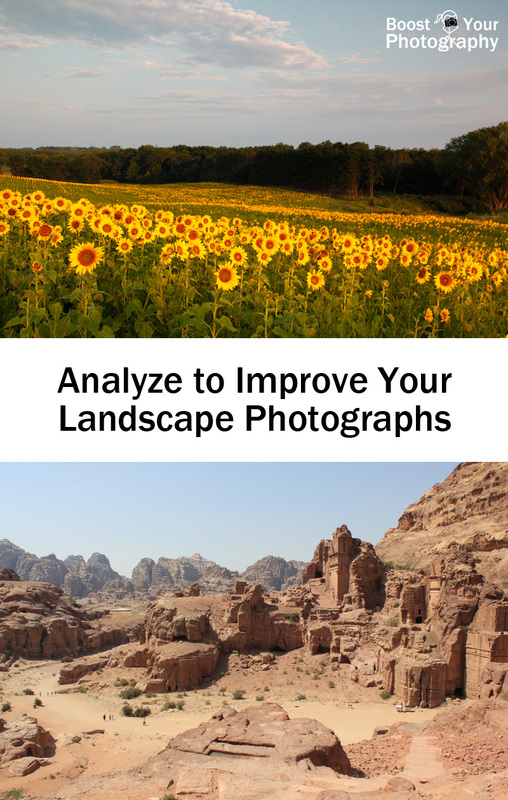 Landscapes are another classic photography subject, and this post will lay out the basics for quickly improving your landscape photographs by learning how to analyze landscape photographs. "Landscape" is a very general photography term, but most often one imagines a vast natural scene with everything in pin-sharp focus. While there are many different ways to photograph a landscape, this post will focus on this most traditional of approaches. To begin, you need to find your subject. If you do not have travel plans lined up for an exotic locale or National Park this week, do not despair. Landscapes and vistas can be found in all sorts of places, if you just know how to look. Spend some time thinking about or, better yet, visiting some local parks in your neighborhood, town, or county. The photograph above was shot at a local conservancy park, which was formerly a working farm. The shot has that vast landscape "feel" even though it only encompasses a single field in area. You do not need miles of visibility to capture a quality landscape shot. There are many composition rules (well, more like guidelines) that can help you with your landscape photography, and many of these are the same rules we discussed in June for that month's Boost Your Photography 52 Weeks Challenge. (Click on any term to read more about the Rule of Thirds, Leading Lines, Filling the Frame, Orientation, and Using a Frame.) Rather than reiterate each of them again, let's analyze a few example landscape photographs and see what works. Knowing what to look for in a landscape photograph will help you know what to look for when setting up your own landscape shots. Let's start with a longer look at the sunflower photograph from before. I really wanted to feature the cloud pattern above the sunflowers, so I used the rule of thirds to put the sunflowers in the bottom of the frame and the clouds across the top two-thirds. The vertical orientation adds to the feeling of height in the image and the sky. The sun had risen about a half-an-hour ago, so there is still a bit of the golden hour in the lighting. The settings for this photograph were ISO 100, f/7.1, and 1/60th, and I used both a tripod and remote. The mid-range aperture keeps the first rows of sunflowers in focus but allows the rest of the background field to blur into bright yellow shapes. 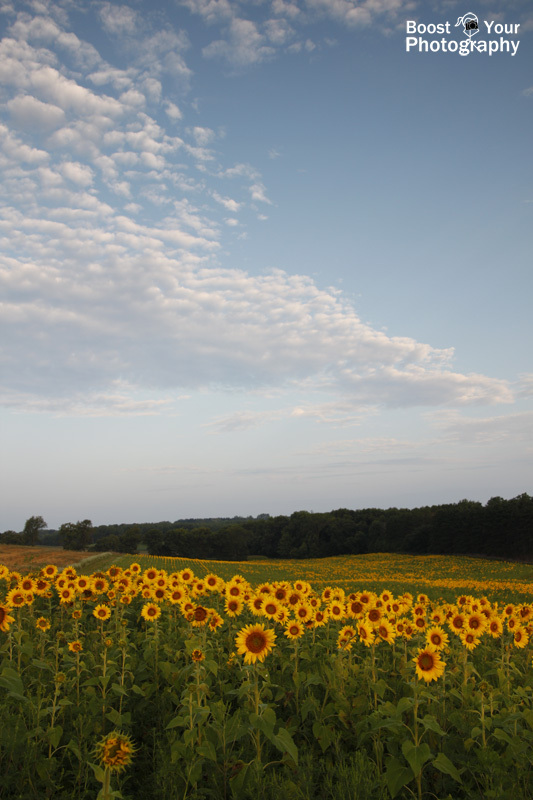 This gives an in-focus foreground of sunflowers, a blurred middle ground of the rest of the field of sunflowers, and the background border of the trees. Having each of these three elements helps add depth to the final photograph, even those the actual distance is only a few hundred feet. Now, this is a landscape image that does rely on a vast view to create interest. 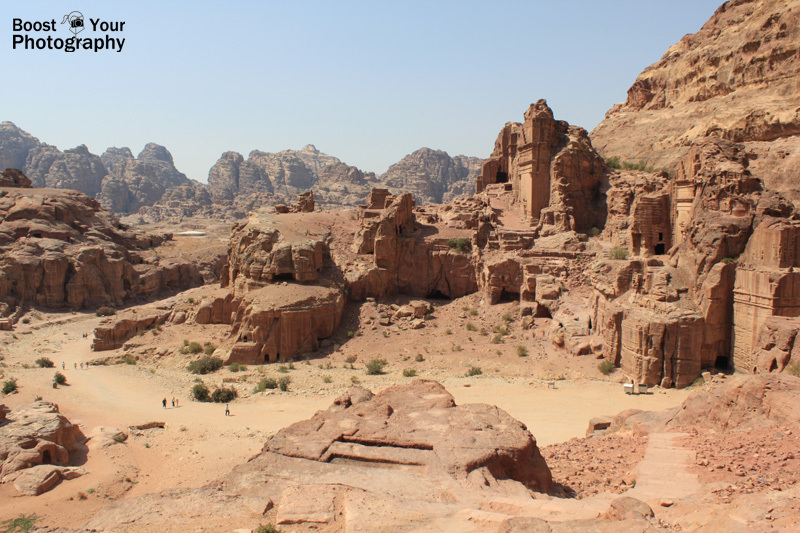 Following the Rule of Thirds we find the location of the tiny, tiny people in the bottom left intersection point, contrasting with the largest of the carved structures in the upper right intersection point. This image also has a very clearly defined foreground, middle ground, and background. The rock outcropping at the bottom provides the foreground, providing an anchoring point for us as the viewer. (I was midway up a very large staircase at the time.) The main section of carvings and structures forms the foreground, and the curving road leads the eye through the image towards the mountains in the background. The light is directional, giving shadows to the people and the structures, and still contains a hint of the morning's golden glow. Because I was traveling without a tripod, this image was captured at ISO 100, f/11, and a shutter speed of 1/125. This gave me a shutter speed quick enough to freeze the motion of the people and to safely handhold. The aperture of f/11 gives a reasonable depth of field, and the majority of the photograph appears in focus. This is related to a photography concept known as "the hyperfocal distance." While this may sound confusing, the basic idea is that you do not always need to use the narrowest aperture to get the whole of your photograph in focus. If you know the hyperfocal distance for your lens, then you know at what distance you need to set your focal point to keep everything in focus. The chart above provides you with a rough set of guidelines. So, for the photograph above, shot at 20 mm with a crop camera, I needed to focus 6.2 ft away from me at f/11 to have everything from 3 feet to infinity in focus. If you want more details on the hyperfocal distance, click the pin to read the whole article. Spend some time with a favorite landscape photograph and see if you can apply some of these same types of analyses. Think about what really makes that image stand out for you. Then, see if you can take those same ideas and principles and apply them to your own landscape photography. This is not about "imitating" another photograph or another photographer's style, but it is about learning what works and what you like and figuring out how to capture that for yourself. Not sure where to start? Here are a few of the ideas we've discussed in this article for analyzing landscape photographs. Think about the composition. Was the photographer using (or breaking) a specific rule or rules of composition? Think about the rule of thirds, leading lines, filling the frame, orientation, using a frame, and more. Think about the foreground, middle ground, and background. Do you notice distinctions between all three in the photograph? How does (or does not) this give the photograph a sense of depth and dimension? Think about the depth of field. Is the whole photograph sharp and in-focus? If so, how does that sharpness draw your eye in or around the image? If not, what do you notice about what the photographer chose to focus on and what is out-of-focus? Think about the light. Can you tell what time of day this photograph was taken? How does the light influence the shadows or the colors of the photograph? Think about the sky. How do the clouds or the colors of the sky work with the rest of the photograph? If the sky is interesting, emphasize it by including more sky in the final photograph. If the sky is less interesting, emphasize the land by including more of it in the final photograph - or compose to eliminate the sky altogether.